Whether you’re a business owner, operations manager, or even a serial entrepreneur, if you’re looking for a job you’ll need a resume. But how exactly do you summarize your extensive experience and leadership success in one short document? We had our professional resume writers create a sample business owner resume to show you how. 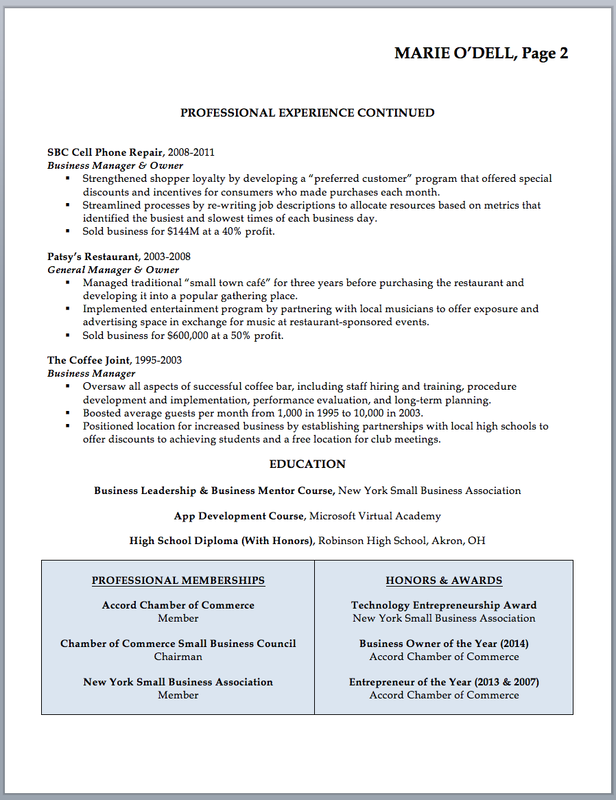 Keep reading to view this expertly written example of a business owner resume. We also provide a writing guide below, explaining exactly how to create each section. Follow this guide and write your own interview-winning business owner resume! 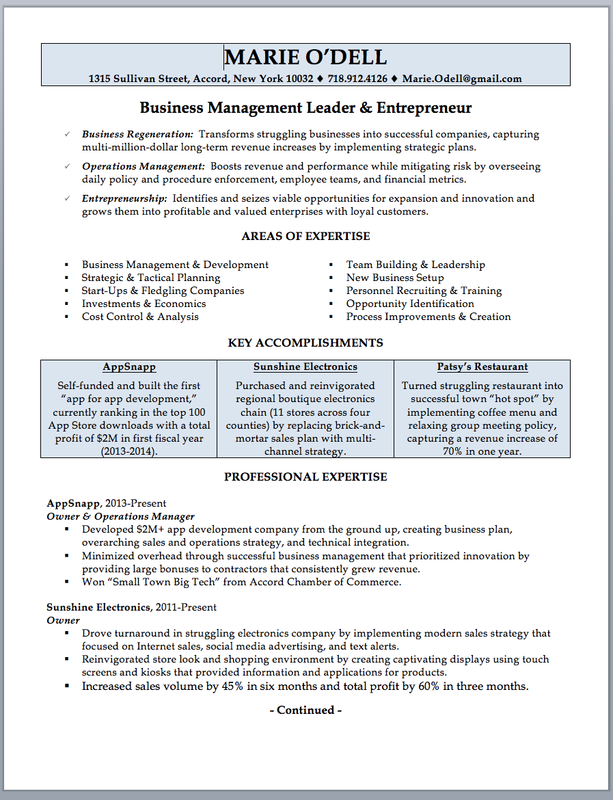 DOWNLOAD THIS BUSINESS OWNER RESUME TEMPLATE FREE BELOW AND MAKE IT YOURS! Use hyphen or a period to separate your phone number, making it easier to read. Be sure to include an email address that sounds professional: yourname@gmail.com is far more appropriate than lakersforlife@hotmail.com. If you have a LinkedIn profile I recommend including the URL. If you don’t yet have a LinkedIn account, I recommend setting one up. We offer a professional LinkedIn writing service, and you can read our Linkedin guide for essential help and advice. Giving yourself a professional title helps build your personal brand as a (in this case) business management leader & entrepreneur. A professional title can also be adjusted for each job application you making, matching it to the specific job title that you’re applying for. For example, if applying for a Director of Operations position, then you should include this in your resume’s headline. This helps highlight your expertise and convince the reader that you’re an ideal candidate for the job. …when writing your resume you should keep in mind the specific responsibilities and directives of the position you’re applying for. Engaging the reader early is an essential requirement of a business owner resume. If you pique the reader’s interest at the start they are more likely to read the document in full, giving you more opportunity to convince them you’re right for the job. Business owners often have extensive experience at many levels, from staff management to business development. However, the inclusion of irrelevant or non-targeted information can detract from the effectiveness of your resume. To avoid this, when writing your resume you should keep in mind the specific responsibilities and directives of the position you’re applying for. Remember, the person looking to hire you wants to see your ability to excel within the role they have to offer. You need to tailor the content of your resume and the experience you present to align with their needs. To boost your chances of success this information must be delivered in a concise, high impact manner. Using the space at the top of your resume to demonstrate your key strengths will really help engage the reader. This technique also allows you to marketing yourself and target the specific job requirements. Most of all, this technique increases the overall impact of your resume. Within the first one-third of your resume your goal is to demonstrate exactly why you’re the ideal candidate. An areas of expertise section is a great way to do this. You’ll see on our business owner resume example that the resume writer cites ten bullet pointed areas of expertise, showcasing the applicants diverse skill set in the world of business. You should look to do the same thing on your resume – this is where you can present the range in your expertise and knowledge. Don’t just match the duties on the job description; analyze the job responsibilities along with the company goals and determine which of your skills are most relevant and desirable. In the business and management world, it’s all about results. Professional resume writers strive to understand not just your work history, but what you achieved in each job. That’s why the most effective resumes are achievement focused – this is especially so with business owner resumes. Showcasing your achievements and success on your resume is paramount, and you don’t have to be subtle about doing this. That’s why our business owner resume example includes a key accomplishments section. Also, notice how our resume writer has quantified achievements wherever possible, for example: “…capturing a revenue increase of 70% in one year“. Quantifying achievements helps improve readability, and increases the impact your resume has on the reader. If possible, include a summary bullet point giving scope to your job, e.g. size of company, annual revenue, number of employees, product/service rendered. Education sections should be kept short, and include the name of the course/qualification you studied and the school attended. If you are concerned about your age then you can leave off graduation dates. If your level of education is likely to help earn you interviews then consider putting this section above your professional experience. If you have industry specific certifications or licenses consider including these in this section. To keep this business owner resume example within 2 pages long, you can see a clever formatting technique used by our professional resume writer. Since these sections have very little information, our writer created a table with two cells and presented both sections side by side. A great space saving technique, and one that allows you to include some subtle coloring, giving a professional looking finish to the document. Did you find this article useful? Don’t forget to like and share by clicking the social tabs below. Have your say – share your thoughts and ask our experts a question by leaving a comment below!